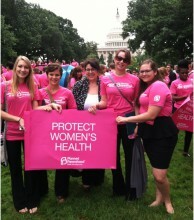 University of Arizona VOX students represent Planned Parenthood Advocates of Arizona in Washington, D.C. Earlier this summer, Planned Parenthood Advocates of Arizona sent four University of Arizona students to the annual Youth Organizing and Policy Conference in Washington, D.C., hosted by Planned Parenthood Action Fund. The conference brings together hundreds of young people from around the country who support the mission of Planned Parenthood and seek to bring awareness around sexual health and reproductive rights to their college campuses. The forum provides an opportunity for young people to learn from each other, share experiences and ideas, and become familiar with the top issues impacting sexual and reproductive health across the country. Apart from the obvious benefit — getting out of the 100-plus-degree weather here in Arizona — this conference is also a perfect venue to inspire and remind young people about the important role they play in the reproductive health, rights, and justice movement. We wanted to take a moment to share some of highlights — from our VOX students — about the conference so you, too, can be inspired as we kick off the fall semester. Although I have been a youth volunteer with Planned Parenthood for five years now, this was the first time I was able to attend one of these wonderful conferences. The 2013 Youth Organizing and Policy Conference brought together like-minded people and encouraged us to speak out about reproductive justice, equal pay, and health care. Not only was it powerful to listen to advocates from around the country share their stories, but it helped me to understand how just a few voices can change the outlook of elections and large policy decisions. My favorite part about the conference was being able to walk through the Capitol and speaking with our Congressmen and women about issues we found important. I also thought it was mind-blowing how many young people there were behind the scenes running our governmental offices! It’s encouraging to know that when we reach out to our representatives, we are also reaching out to people of our age who help them in office. Overall I had a great experience in Washington, D.C. I walked away with many new ideas for outreach and also a renewed sense of optimism about our continued fight for our civil liberties. My experience at YOPC was truly inspirational. We were able to see and meet so many amazing people. My favorite part of the conference was lobby day, when we were able to meet with five Arizona congressmen and women to discuss issues important to young people and Planned Parenthood. Those who were involved in planning the conference did an incredible job, and I hope that I can attend another conference like this in the future! Attending the Youth Organizing and Policy Conference in Washington, D.C., was such an eye-opening and inspiring experience. We were so lucky to be able to meet with five supportive Congressional representatives from Arizona, which really gave me insight into what the lobbying process is like in Congress. While we were pretty exhausted after running around on Capitol Hill all day, the experience itself was extremely energizing and it felt awesome to be able to actively participate in the political process. The rest of the conference was just as awesome, and incredibly encouraging. In a time when it seems like there is a new anti-choice or anti-woman bill passed every day, it was amazing to see all the great work that is being done to push back across the country. I found it especially heartening to hear from students from states like Texas, North Carolina, and Florida, who are putting up an amazing fight against the choice-limiting legislation that is coming out of their states. Overall, I came back from the conference motivated and ready to implement what I learned with our VOX chapter next semester. We all wish the UofA VOX crew best of luck on campus this year and look forward to seeing what they do! To find out about a VOX chapter near you, check out Planned Parenthood’s website.